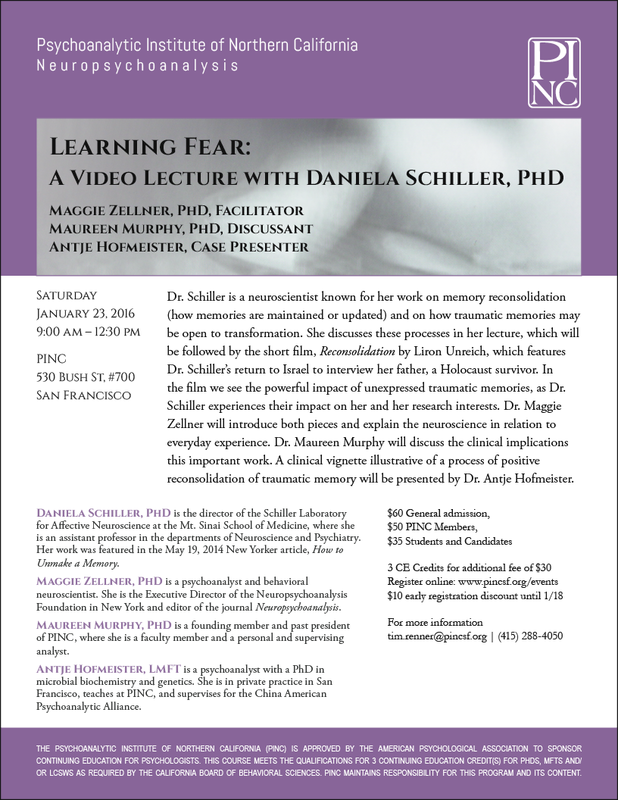 Dr. Schiller is a neuroscientist known for her work on memory reconsolidation (how memories are maintained or updated) and on how traumatic memories may be open to transformation. She discusses these processes in her lecture which was taped at the Pfeffer Center for Neuropsychoanalysis in New York City. The lecture will be followed by the short film, Reconsolidation by Liron Unreich, which features Dr. Schiller’s return to Israel to interview her father, a Holocaust survivor. In the film we see the powerful impact of unexpressed traumatic memories, as Dr. Schiller experiences their impact on her and her research interests. Dr. Maggie Zellner will introduce both pieces and explain the neuroscience in relation to everyday experience. Dr. Maureen Murphy will discuss the clinical implications this important work. A clinical vignette illustrative of a process of positive reconsolidation of traumatic memory will be presented by Dr. Antje Hofmeister. Partial Recall: Can neuroscience help us rewrite our most traumatic memories?